A Feedback Report is an alternative way of looking at a set of DISC results: from the perspective of the person who answered the questionnaire. It's only natural that a person completing a DISC questionnaire will be curious to see the outcome. Providing them with access to their own results is not only best practice, but also a great way to engage them with the profiling process and help to drive discussion. 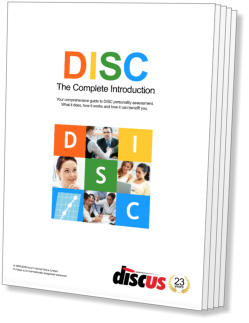 The level of depth and detail in a full Discus DISC report isn't the ideal vehicle for feedback of this kind, especially if it includes Job Matching information. For that reason Discus includes a second reporting option, the Feedback Report, that's designed specifically for the candidate to review their own results. A clear introduction to the personality report, with accessible explanations and graphics. Exploring the fundamental values that lie at the heart of the personality. Focussing on the major strengths of a personality, as well as potential limitations. The Feedback Report is much briefer than a full Discus report, written in a friendly accessible second-person style, with lots of explanatory text. Inside the report is an overall summary of the personality, and a series of sections covering topics likely to be of interest to someone reading their own personality report. For example, it provides a comparison against the population as a whole, and looks at topics like personal development and relating to other people. The report finishes with a brief section on career planning, as a helpful guide to the kinds of roles that suit the reader best. A look at potential changes within the personality and effective ways to achieve them. Important questions of a personality's communication style, including the perceptions of others. A summary of the key work skills and aptitudes described by the personality profile. Some useful guidelines about possible career directions suited to a personality. Discus doesn't just provide the Feedback Report itself, but also some useful features to help you make the most of it. For example, you can choose to have Discus send a copy of the Feedback Report automatically as soon as a candidate completes their questionnaire. The candidate feedback report is instantly available for review in your browser. Create a PDF copy instantly, or mail the report directly to the candidate using Discus' built-in e-mailing facilities. Feedback Report Contents: Discus Feedback Reports are broken down into seven separate topics covering a range of subjects relating to both the reader's work and personal life. Completely Optional: Note that the Feedback Report is a completely optional feature of Discus, and there's no requirement to provide your candidates with feedback if you'd prefer not to. Feedback Availability: Feedback Reports are provided free of charge with all Enhanced Discus reports, and are available at other report levels through a subscription service. See a Sample Report: If you want to see how these topics are presented to the person who completed the questionnaire, you can see a sample Discus Feedback Report for yourself.